The board will remember the firmware so you will only have to complete this step once. Search for "curie" and install the Intel Curie Boards by Intel. Close the Boards Manager once the installation is complete. Select the correct serial port under the Tools > Port menu. On Mac, it's something like /dev/cu.usbmodemXXXXX. On Windows, it's probably the highest-numbered COM port. You will need to use the Firefox web browser for this extension. Download and install the Scratch Extensions Browser Plugin for "other web browsers"
NOTE: You might see "Allow scratchx.org to run "Scratch Device?". Click "Allow...". You might see another message, "Allow scratchx.org to run plugins?". Set both Adobe Flash and Scratch Device to "Allow and Remember" and click OK. When you see the indicator light in the "More Blocks" tab turn green your ready to start using the extension! 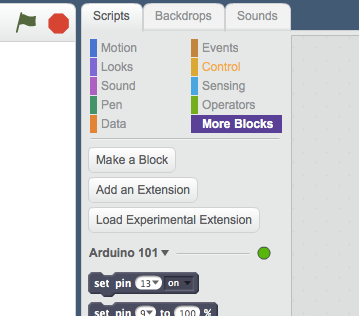 Now take a look at the Scratch Blocks and the example projects to learn how to use the extension.